Falvey Memorial Library :: What Is ASL Poetry? What Could Be Courageous About Performing It? What Is ASL Poetry? What Could Be Courageous About Performing It? Imagine you write poems and want to share your work in a poetry slam. Now imagine that you don’t speak the language because you communicate with American Sign Language (ASL). Aneta Brodski, a deaf teen, does not need to imagine that scenario because she has lived it. 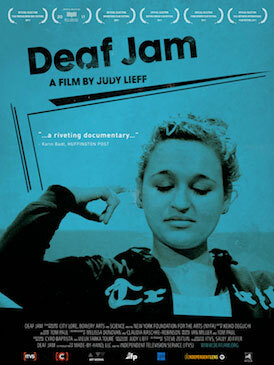 The film Deaf Jam documents Aneta Brodski ‘s courageous participation in a spoken-word poetry slam. A visual language, ASL’s handshape, movement and spatial location combine to form complex meanings that may be difficult or even impossible to translate into spoken English. How does Brodski persevere or hope to succeed in such a competition? To answer that question, her visual ASL poetry, like the film itself, must be seen. Join the Villanova community for Deaf Jam on Saturday, Oct. 5, 2013, from 3-6 p.m. in the Connelly Cinema, followed by a discussion with two participants in the film and an optional poetry slam and ASL poetry workshop. For more about American Sign Language poetry, Falvey Memorial Library offers books and articles about this uncommon visual art. Villanova University’s American Sign Language Club also serves as a resource for students. Gerald Dierkes is an information services specialist for the Information and Research Assistance team, senior copyeditor for the Communication and Service Promotion team, and a liaison to the Department of Theater.